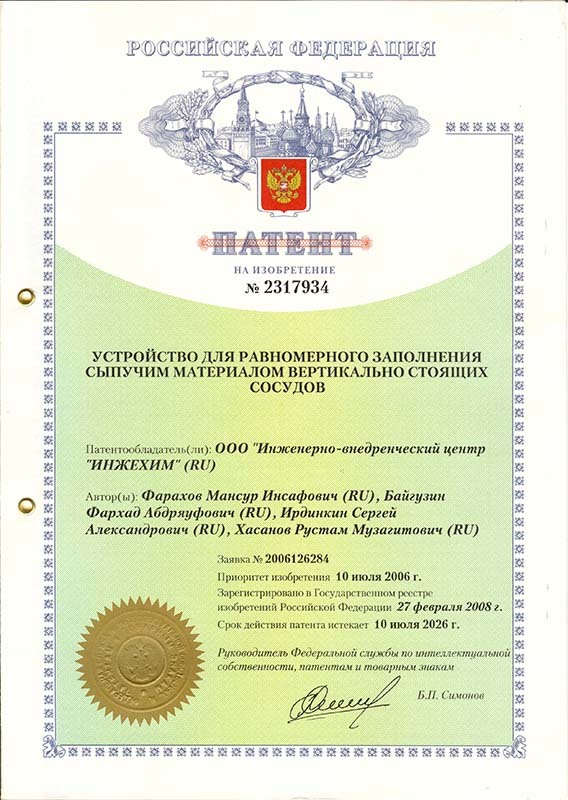 ﻿EPC “Ingehim” (EPC “Inzhekhim”, as in some older unofficial documents and affiliations in scientific publications of our employees) offers an in-house patented granular material loader device (Russian patent No. 2317934) intended for uniform loading of vertical vessels of diameter 700 to 6000 mm (to 9000 mm – at the request of the Customer) used at chemical and petrochemical plants with bulk solids. The loader device has a function for changing the discharge of granular materials to achieve minimized scuffing and minimized deterioration of bulk solid particles by permitting free motion of particles inside the dense bed. Also the loader device has a function for changing the area of spread of particles by changing basket’s rotational rate. The loader device is simple, reliable, easy to operate, unified for various kinds of bulk solids, and highly efficient in forming uniform distribution of bulk solids across a cross-sectional area of the vessel. The loader device was applied by EPC “Ingehim” successfully for loading vessels with catalysts, adsorbents and inert granular materials at the Ethylene and HDPE plants at the Kazanorgsintez chemical enterprise (Kazan, Russia) (see reference list). A declaration of conformity with the Technical Regulations of the Customs Union was granted to the loader device. The general view of the loader device is shown in Fig. 1. The loader device is composed of storage capacitor having a branch pipe for feeding granular materials, pneumatic drive installed on storage capacitor’s cover, system for controlling (stopping) granular material feeding comprising punched bottom of storage capacitor and a movable gate valve consisting of a grid containing conic elements installed on it, and, finally, a distribution device (“basket”) comprising four annular disks equipped with spades. Overall dimensions of the loader device: diameter – 450 mm, height – 600 mm. Granular material (adsorbent or catalyst) enters a storage capacitor, fills its volume and after the gate valve is opened, granular material starts scattering over a surface of the pneumatic drive that is used for revolving annular disks around a shaft. Centrifugal force values differ from one annular disk to another; the difference forms distribution of granular material particles across a cross-sectional area that resembles a rain shower. 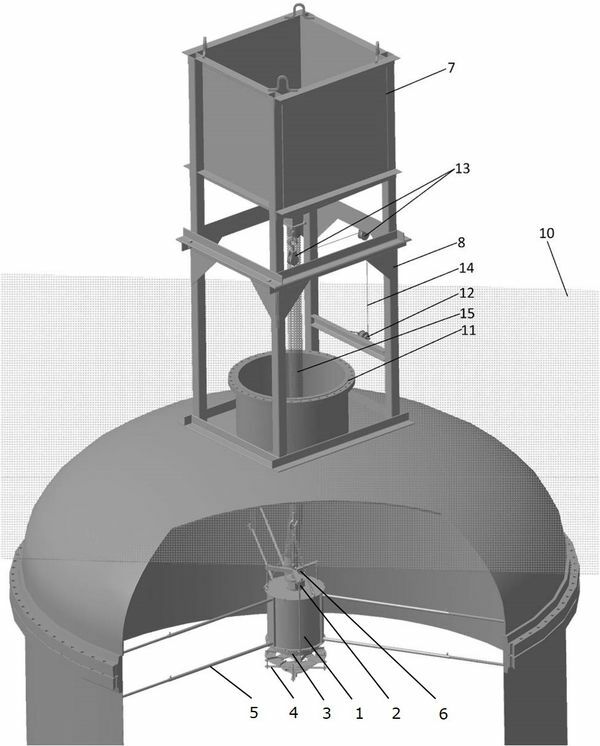 The loader device is installed into the vessel using a robe fixated to the ends of chain haulages (Fig.2). The other end of the rob is installed outside of the vessel on a hoist allowing to perform lowering, lifting and aligning of height of installation of the loader device over a layer of granular materials (or over vessel’s bottom). Height of installation of the loader device over a layer of granular materials depends on diameter of the vessel and usually makes up 0.6-1.5 m. The loader device is positioned in the vessel using distance rods with rollers. Granular materials are loaded into the loader device through a feeder containing a set of conic tubes fixed to each other using chains. The upper operating platform contains intermediate (receiving) hopper of capacity 1-1.5 m3 for receiving granular materials. Intermediate hopper has a gate valve and a fastener system for fastening a feeder; if necessary, a roller block can be installed on intermediate hopper for centering the loader device. Intermediate hopper is filled with materials poured down from transport hoppers lifted to the height by hoisting machines. To avoid overturning, strainers are used to fixate intermediate hopper to the operating platform. During the loading action, presence of people in the vessel is not permitted. All operations on routine maintenance of the loader device are performed from the platform holding the intermediate hopper. In need of performing surveys and other operations during loading, the gate valve of intermediate hopper must be off whereas the drive of the loader device must be on. Dust formed during motion of bulk solids is removed from the vessel using a fan. © 2011 LLC EPC "Ingehim".